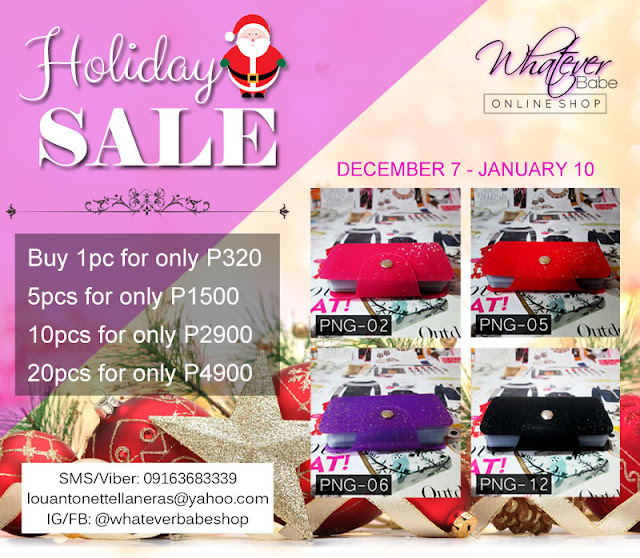 Whatever Babe: WhateverBabeShop Holiday SALE 2015! I can't believe it's almost been a year since I started peddling my products in hospitals and schools here in Metro Manila. It just overwhelms me that a lot of people still appreciate the products that are mass produced by a single person. Yes, from conceptualization to labor to marketing, I've only relied on myself. I've found that it has been a very potent tool for me to go out my comfort zone and try on the shoes of a raketera. Because of this desperate need to make money outside my day job, I was able to prove to myself that I'm not an unlucky person when it comes to careers. I was just too lazy to go chase after what I really want. And baby, being an entreprenurse aside from being a fulltime blogger feels bloody awesome. As a gesture of gratitude to everyone: every student, nurse, teacher, review trainers and fellow entreprenurses who made my small business Pocket Nursing Guides a success within a year, here's a holiday treat from WhateverBabeShop! Four of the most requested colors (and unbelievably the ones almost always out of stock) Black, Pink, Violet and Red are now ON SALE! From December 7 to January 10, every nurse and future nurses, even those in need of a business sideline, now have the chance to order these top selling items at discounted prices. Pocket Nursing Guides are the perfect gifts for those in the nursing profession this Christmas. Whether you be a student, a nurse on duty, a clinical instructor or a hopeful NLE reviewee, Pocket Nursing Guides will help you memorize the most basic of concepts that will help you in the most unexpected of times. Forgot the computation for Potassium deficit? Can't recall which drug to give during an arrhythmic attack? Need a quick cheat before placing the chest and limb leads for an ECG procedure? Just reach into your pocket and read up. It's there. It's very lightweight, very handy and more importantly, it's chock full of organized basic nursing information you won't find collated anywhere else. Plus, you won't worry about it fitting in with your classy handbag. It looks nothing like a regular boring little book. You can even use it to store some hush hush info before a quiz (and nobody will find you out). Whatever color you fancy, Pocket Nursing Guides will always be there for you.